Most slots players love getting rewards from online casinos whether it’s free spins, bigger bonuses, or fun contests that they can enter. However, this month a promotion was announced that’s kind of a combination of all three of those things and it’s something that many readers will definitely want to check out. Even though the BetOnline Casino accepts players from the United States, they also take on most people from around the world as they have very few regional restrictions. This is all part of their corporate mandate which demands inclusivity regardless of country of origin, ensuring that everyone has equal access to their fun gambling games. 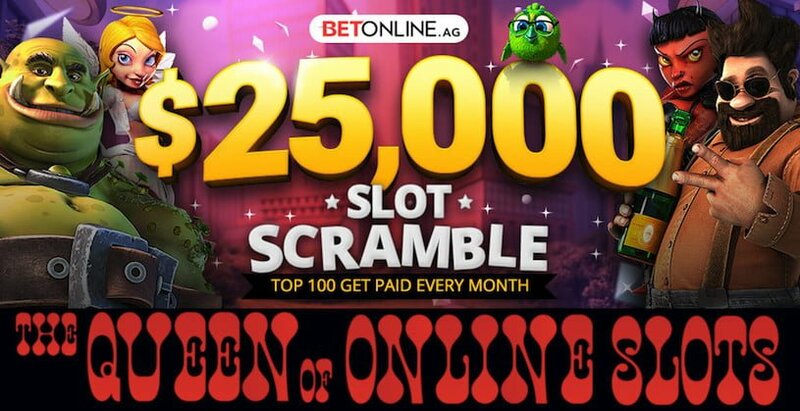 Now they’ve gone an extra step and announced their new $25,000 Slot Scramble that will reward players simply for being themselves and playing as they normally would. All you need to do is play any of their great machines and finish in the Top 100 for most amount of spins made and you’ll get a chunk of the $25,000 prize pool. The bonus breakdown is quite fair with the Top 10 getting $500, places 11 to 50 getting $250, and anyone finishing in spots 51 to 100 getting $200. You can then use those funds on any game you like but you’ll have to meet their 25x rollover before you can withdraw any winnings. Also, make sure you get to work because any unused funds will expire from your balance if unused after 14 days. This promo is running every month until further notice so if you want to take a shot at this meaty prize pool, go open a new account at the BetOnline Casino today and get spinning. It’s time you got some rewards just for being you!